The Jaguar X-Type may be the entry-level model but it looks unmistakably like a Jaguar. Better still, the X-Type smells and feels like a Jaguar, with all the traditional British ingredients that have defined the brand for seven decades. The Jaguar X-Type is elegant, comfortable, and fun to drive. It represents a low cost of entry for a Jaguar and for the class. The X-Type gives its owner the distinction of driving a Jag. It also offers the benefits of full-time all-wheel drive. That makes the X-Type a good choice for rain, snow, and ice; and indeed it feels very secure in those conditions. The X-Type competes with the BMW 3 Series, Mercedes-Benz C-Class, Audi A4 and other near-luxury cars. The performance of the Jaguar compares favorably to these cars, while offering a distinct difference in feel and temperament. As with the other cars in its class, the X-Type is smaller in size, making it easier to park and maneuver. A wagon is available that offers great cargo carrying capacity while maintaining Jaguar's unique style. It comes with a tailgate with independently opening rear window, luggage tie-downs, removable luggage cover and cargo net. It features a neat hidden cargo compartment under the rear floor with a 12-volt power outlet as well as a higher level of standard equipment. Quality has improved considerably since the X-Type was introduced, as evidenced by the J.D. Power & Associates 2005 Initial Quality Study, which also cited Jaguar's Halewood plant in the U.K., where the X-Type is manufactured, for its overall quality performance. The X-Type is certified as an Ultra Low Emissions Vehicle (ULEV), meaning its exhaust is extremely clean. The X-Type has been maligned by the press for sharing its basic structure with the Ford Mondeo sold in Europe and for not being a true Jaguar. Perhaps the X-Type has shown Jaguar the lower limit for stretching its brand. But the X-Type is a good car. The 2007 Jaguar X-Type comes in just two models: the sedan and the wagon. Both are powered by a 3.0-liter V6 rated 227 horsepower, driving all four wheels through a five-speed automatic transmission. A five-speed manual is no longer available. The X-Type sedan ($34,330), which Jaguar sometimes refers to as the X-Type 3.0, comes with automatic climate control; leather upholstery; eight-way power driver's seat; 70/30 split folding rear seats; Bronze Sapele wood interior trim; tilt-and-telescope steering wheel; six-speaker, 120-watt AM/FM/CD stereo; power locks; one-touch power windows; a power tilt-and-slide glass sunroof; automatic headlights; and 16-inch alloy wheels. The Sportwagon ($39,330) is somewhat better equipped, adding a 320-watt premium Alpine sound system, a wood-and-leather steering wheel, 10-way power adjustable seats for driver and front-seat passenger, electrochromic mirrors inside and out, rain-sensing windshield wipers, a programmable garage-door opener, message center and trip computer, Reverse Park Control, and 17-inch alloy wheels. The cargo bay features a retractable security cover, a cargo net, four-spring-loaded tie-downs, and a 12-volt power outlet inside a hidden storage compartment. A Luxury Package ($2,400) for the sedan adds some unique appearance items, including contrasting piping for the leather seats, burl walnut veneers, bright mirror caps, rear treadplates, and 17-inch wheels (of a different design than the wagon's). It also brings the sedan closer to the Sportwagon's level of equipment, with a wood-and-leather-trimmed steering wheel, eight-way power passenger seat, electrochromic mirrors, memory for the driver's seat and side mirrors, Reverse Park Control, rain-sensing windshield wipers, programmable garage door opener, and a message center and trip computer. Options include heated front seats ($500), Reverse Park Control ($325), DVD-based navigation ($2,300), Bluetooth wireless connectivity ($500), 320-watt Alpine sound ($800), Sirius Satellite Radio ($450), metallic paint ($595), custom-order paint ($1,000), and 17-inch wheels ($700). Eighteen-inch wheels with 225/40ZR18 Pirelli P-Zero performance tires ($800) are available on Sportwagons and on sedans with the Luxury Package. The wagon can be ordered with black (instead of silver) roof rails for no extra cost. Safety features for both models include dual frontal, side-impact and side-curtain airbags managed by a sophisticated sensor system; pre-tensioning front safety belts with load-limiters; and three-point belts for all seats. Dynamic Stability Control (DSC) is now standard as well, and so is antilock braking (ABS) with Electronic Brake-force Distribution (EBD). Despite its diminutive size, the X-Type is clearly a Jaguar. That's just as well, as ever since Ford took over Jaguar, purists have been scrutinizing every move the company makes in an effort to turn up some evidence of Fording-down the illustrious British marque. Because the X-Type shares ancestry with Ford of Europe's front-wheel-drive Mondeo, Jaguar endowed the X-Type with all-wheel drive as a standard feature. This helps set it apart not only from the Ford, but from most other near-luxury models where such a feature is optional, and usually only offered on a handful of models. The X-Type is nearly 10 inches shorter than Jaguar's mid-range S-Type. It is not, however, the smallest car Jaguar has yet manufactured. Compared to the 1960 Mark II, which inspired the curvy styling of the current S-Type, the X-Type is only a fraction of an inch shorter in wheelbase and actually measures almost 4 inches longer overall. It is also 4 inches wider and about 1-1/2 inches lower than the beloved classic. Still, Jaguar chose to tie the X-Type's identity with that of the sleek flagship XJ, rather than the buxom mid-range S, and that meant making a relatively short car look low and long. They did it using lots of horizontal lines and body sculpting. The illusion is generally successful and the X-Type looks bigger on the road than its dimensions suggest. The design of the grille and headlights, with fluting that sweeps back over the hood, emphasizes the baby-XJ image. The front view is broadened with two sets of side-by-side round lights flanking Jaguar's traditional horizontal split grille. This makes the X-Type look more conservative than the S-Type, which features a unique round grille (inspired by the old Mark II). Like the S-Type, however, the X-Type's grille texture was changed to a fine chrome mesh last year, and this look continues for 2007. Riding the hood of the X-Type is the traditional bounding Jaguar known as the bonnet leaper. All in all, this is a ground-loving vehicle that makes the eye believe it is longer and lower than it is, and bigger as well. What at first blush seems to be busy-ness about the indents, horizontal lines and visual cues of Jaguarness fades with on-going exposure, evolving into acceptance and even appreciation. Anyway, the car looks better on the road than it does in pictures, or even in the showroom. And its overall visual stance seems unaffected by the all-wheel-drive system. The Sportwagon is identical to the sedan up to the B-pillar. From there back it has different side doors and obviously a longer side profile. Its overall length is less than two inches greater than the sedan so there is little extra overhang in the rear; although (counting the roof rails) it stands about 3-1/2 inches taller. The tailgate slopes forward, appropriately giving it a sleeker look than most station wagons. The window in the tailgate can be opened independently, a long-standing feature of Ford wagons that's very handy when loading lightweight items. For securing heavier cargo, Jaguar has thoughtfully supplied four spring-loaded D-ring tie-downs in rear load area. The X-Type is a real Jag on the inside, too. Jaguar's leather and wood are done as well as they were in the days when those luxury touches were not added to every model on the road. The seats are quite good, supportive and comfortable, and they can be adjusted every which way. And they offer reasonable side support as well; we had no trouble staying in them while flinging the car around. The cabin has a spacious feel, and outward visibility is enhanced by the slimness of the roof pillars. With the elevation of the driver's seat easily adjustable, drivers of varying heights have an excellent forward view over the hood. The outside mirrors are particularly generous in size, a welcome safety feature at a time when mirrors on some cars are getting smaller. All the switchgear operates intuitively. Controls fall within easy reach, and the steering wheel tilts and telescopes, allowing any driver to adjust perfectly to the car. People of all body types will find a comfortable home in the X-Type. Lots of stowage inside the X-Type adds to the convenience. The doors have a handy tray near the door handle, as well as a large main pocket. There are dozens of nooks to stow phones, cassettes, CDs, pens, maps, or tissues; even ice scrapers and an umbrella. There's a retractable hook in the glovebox release to hold a handbag, small shopping bag or take-out. The center console is small, however, and there is only one cupholder. The design of the X-Type isn't all about style. The sedan's trunk is big, something that can't be said for all Jaguars. With 16 cubic feet of cargo space, the X-Type beats the impressive trunk of the Audi A4 (13.4 cubic feet) and the relatively dinky boots in the Mercedes-Benz C-Class (12.2) and BMW 3 Series (12.0) sedans. Further, if you pull one or both of the small handles in the X-Type trunk you can easily flip the rear seats forward for carrying longer items. That makes this a practical Jaguar. Even more practical is the Sportwagon. With the seats folded down it boasts a cargo capacity of 50 cubic feet, which puts it ahead of the Audi A4 Avant or Mercedes-Benz C-Class wagons, if slightly behind the 61 cubic feet of the BMW 3 Series wagon. However, the official dimensions do not include the Jaguar's very useful hidden storage area under the rear floor, which can be used to stash cameras and other valuables in a molded compartment with dividers. Even more forward-looking is the 12-volt outlet inside the compartment. It allows recharging of a laptop computer or digital camera while totally hidden from prying eyes. The Sportwagon also offers a bit more headroom, front and rear, than the sedan. When it was introduced, the Jaguar X-Type set new standards for rigidity of structure. A rigid structure translates into a car that can be tuned to ride smoothly and quietly while cornering like a cat. Our first experience with the X-Type sedan bore this out, and it was confirmed in the X-Type Sportwagon. We've driven the X-Type down winding rural roads near Dijon, France, over mountain roads in north Georgia, and around the high-speed banked oval of Atlanta Motor Speedway. The X-Type was the epitome of stability and confidence in the high-speed sections. Yet it rode smoothly on the streets of Atlanta. The narrow, high-crowned pavement in France follows the wandering ways of long-ago farm animals over varied terrain. When polished by rain, it becomes a driver's challenge. The dampness was simply erased by the all-wheel-drive system, which offered comforting security. On the French roads, the X-Type seemed to rise to every challenge. Whether on a major highway or winding back road, it always felt smooth and stable. The steering was sharp and precise, and the car feels nimble in corners yet secure at speed. To further explore its capabilities, we took the X-Type onto a tight handling course near Atlanta. A corner flooded with water showed off the advantage of the optional 18-inch high-performance Pirelli P Zero tires, which provided better grip in the wet than the standard skins. They greatly reduced understeer (the tendency of the car to push out toward the outside of a turn when the front tires lose grip). That flooded curve also helped demonstrate the value of Jaguar's Traction-4 all-wheel-drive system. The system incorporates a center differential and viscous coupling to split the torque 40 percent to the front wheels, 60 percent to the rear. Slippage at either set of wheels will send more power to the opposite end of the car. The viscous coupling automatically and transparently transfers power away from slipping wheels to those with the best traction, helping to keep the X-Type moving forward and tracking true no matter the conditions underneath. In short, the X-Type performs well in the wet and we presume it handles well on snow and ice. The now-standard Dynamic Stability Control can help a driver maintain control in an emergency handling situation. DSC minimizes skidding by applying the brakes at selected wheels, something no driver can do. It can help the driver avoid an accident. It reduces the chance of spinning out. We found it makes the car easier to drive at the limit of the tires. It reduced yawing when charging too fast through a slalom. DSC can be switched off for those rare times when the driver feels it's too intrusive, as when we drove the S-Type on a closed course at Atlanta Motor Speedway to test its limits. By default, the system switches back on every time the car is re-started. The X-Type feels equally comfortable on the highway and in fast, sweeping turns. It was supremely stable at 120 mph on Atlanta Motor Speedway's back straight and felt confident turning in for the banked turns at that speed. It was easy to drive flat out through the facility's infield road racing circuit. The well-controlled suspension and the all-wheel drive add to the X-Type's confident feel when driving at the limit. And the X-Type offers predictable handling when pushing its tires beyond their limits, something that can happen at much lower speeds when it's slippery. It felt comfortable when braking and turning at the same time, a move that ruffles many cars. The handling is quite neutral, understeering at times, yet willing to rotate according to the skilled driver's wishes in the middle of a turn through use of the throttle. 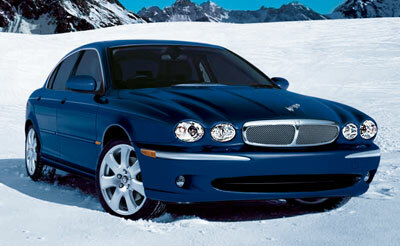 The Jaguar X-Type offers luxurious accommodations in a relatively compact package. It comes with all-wheel drive. It offers the distinction of a Jaguar, as opposed to the BMW 3 Series and Mercedes-Benz C-Class. However, it's a dated product compared with the other cars in its class. NewCarTestDrive.com correspondent John Rettie filed this report from Palm Springs, California, with Denise McCluggage in Dijon, France, Mitch McCullough in Atlanta, and John F. Katz in Harrisburg, Pennsylvania. Head/hip/leg room, f: 37.9/NA/42.4 in. Head/hip/leg room, r: 38.9/NA/34.4 in. Cargo volume: 50 cu. ft.